Yes, of course—digital resumes are rapidly becoming important assets to the modern jobseeker. However, for those living in a tech-savvy world, it is important to remember that the printed resume still plays a major part in landing an interview—and advancing a career. Whether a job seeker is dishing out CVs at a job fair or mailing their portfolio to an employer across the country, printed resumes carry a lot of weight. 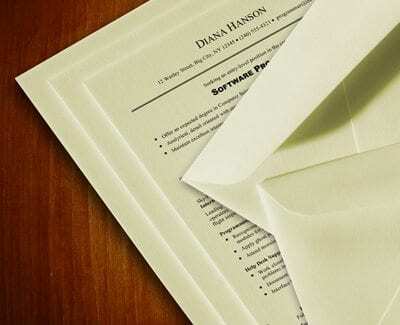 While it is easiest just to print out a document on your traditional white copy paper, this piece of parchment can quickly get lost among the many other printed resumes that hiring managers receive. This predicament raises the important matter of resume paper—essentially, really luxe paper that can transform the appearance of a CV. Heavier stocks, deeper tones and crisper qualities are all facets of this type of product that can help any job seeker’s work history stick out in a bold and professional manner. Just as many homeowners are overwhelmed by the many shades of white found in paint and carpet colors—from cream to eggshell—job seekers will discover that there are quite of few hues for resume paper. When selecting a color, it is best to keep personality in mind—selecting a resume paper tint is an excellent way to show off who one is as a professional. Almond colors may hint toward greater authoritativeness, while ivory resume paper could suggest a docile yet clean presentation. Some may utilize other shades, including grays or even blues. Whatever the case, it is important that the shade one selects is a subtle departure from the basic glaring white that comes with generic printer paper. Most resume papers offer a unique texture delivered through a cotton-based material. How much cotton one wants to put to use in their resume paper is up to the job seeker, but the more linen-based it is, the more of an impression it may make. While “business paper” utilizes approximately 25 percent of cotton, the result may be a little stiff or smooth. However, 100 percent cotton linen resume papers offer a very textural experience to whoever is physically handling the CV, possibly making it a more memorable CV. It is important to note that the more cotton-based a resume paper is, the more expensive and limited in quantity it will be. With that in mind, for those who are looking to distribute many resumes at once—such as at a job fair—it may be smarter to use a 25 percent cotton paper. For those who are trying to make a strong impression on a single recruiter or employer, 100 percent linen is a safer investment. While it is always important to build an online presence in addition to a paper resume, it is essential for every job seeker to make sure they have their bases covered in presentation. As such, many may find that it is also effective to print other related materials on resume paper, such as cover letters. The more care one takes in presentation, the more likely it is that an employer will form a strong impression of the individual. Taking a step away from copy paper really illustrates one’s willingness to take a career seriously. If nothing more, a nicer paper is harder for employers to crumple up and throw into the wastebasket. For those who have got the paper but have no idea what to put on it—hope is not lost. Chic Resumes is here to assist with an informed staff that can help craft a beautiful work history that is formatted, relevant and job market savvy. Review our services or contact us today at (803) 831-7444 or resumewriting@grammarchic.net to get your resume in shape and on paper!